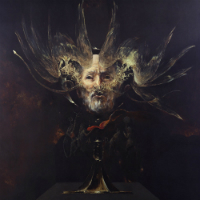 BEHEMOTH's music is awe-inspiring in its own right, and although I am always humbled to write about any band, this was cemented as a special experience. Partly also because it meant I was allowed an early listen to their 2014 follow up to "Evangelion". Poland's extreme Metal masterminds return in full force, utilizing their infinite collective, creative pool to prove that pens and instruments can create an immortal philosophy; a train of thought that has a bearing on any human, regardless of belief or lack of. Quite literally one of the most influential metal bands in existence. Metal journalists that preceded me with their own surreal experience with this album contend that this is the best BEHEMOTH album ever made, and no part of me disagrees. Many of us have heard "Blow Your Trumpets, Gabriel" (if not, I implore that you get to it). It is exemplary of Nergal's talent in turning Metal into poetic art. A particularly dark take on the leading up to what is recognized as the end times, it is an enthralling tale; equally beautiful as it is nightmarish. The song veritably grows in power and grandeur; with time, the timbre of the instrumentation and the artful lyrics exponentially grow as the tale reaches its climax; a fine example of expert composition. Perhaps it is my overactive imagination, but the track that follows, "Furor Divinus", seems to reciprocate the opening track by projecting a brutalized wasteland with its soundscape. Because that is what the track is; brutal, and barely unrelenting. Once again, as with essentially all of BEHEMOTH's previous material, the band proves they are able to forego any notion of an impenetrable wall of sound found in much extreme Metal. While the track is, riff for riff, the fastest and most aggressive track on "The Satanist", it is regardless able to convey the pure essence of furor. Not once did I felt lost in the mix, so much as I felt as if I was allowing the music to allow me to understand the message. Down the line was a track special to me, and one of my favorite found on the record. "Ora Pro Nobis Lucifer", also recently (and teasingly) released as a lyric video to precede the album. It came as a different form of aggression to "Furor Divinus", with a kind of brutality that was kept under a firm grip of order with which Nergal seemingly chose to forego the previously-heard bombastic vibes. What we have in this track is a Metal masterpiece that is systematic and deadly accurate in communicating the true essence of the album. I say it is personally special to me, because I am very much a fan of the band's "Satanica" album; this track reminds me both of that (the original) version of "Chant for Eschaton", and also the modern recording; one of my favorite BEHEMOTH tracks of all time in either incarnation. I hope it is not cliché to say that each of the nine tracks is special; lastly, I would take particular care to mention the title track. Compared to the rest of the album, it is intellectually set apart from the rest of the record's pieces inside its own bubbled realm; not at all to say that it is a bad fit for the album; on the contrary, in fact. Almost entirely mid-tempo, a subtle groove concreted by the delicious-sounding rhythm section pounds out Nergal's hellish screaming of the sheer purity of the message of "The Satanist" with a vigor that has been churning for years. This album, to me, is a new benchmark by which BEHEMOTH's career will be defined in the future. The mixing of the album is perfect; it comes across as organic and far from over-produced, and I am able to pick out and focus on every sonic piece of the timbres. The lead guitar work and vocals especially, surpass their most blistering and brutal works previous. This album, to me, is not just a brilliant comeback; it is a philosophy in its own right. I am in awe. BEHEMOTH, for me, was an acquired taste. It took me a while to find the right song to hook me onto everything Nergal and crew were trying to offer with their music. "Evangelion" was, no doubt, the album that cemented me as a fan. It had just enough insanity mixed with melody to appease me for quite a while. I still have the special edition on the top of my CD crate, it's almost always a first choice when I want to blast some good music. Not to mention, BEHEMOTH has a great art direction which always makes people curious enough to let me either horrify or intrigue them with their unique blackened-Death style. However, as I am now on about my third play through of "The Satanist" - I have to say that this album is probably their best effort to date. I will warn the ‘elitists’ ahead of time, what's been done on "The Satanist" is something a little more paced than previous BEHEMOTH albums. All the heaviness is here, way more than enough to please fans and newcomers, but a good deal of BEHEMOTH’s Black Metal influence is way gone (strange considering that the album is called "The Satanist"). Instead, there are far more melodic elements, a whole lot of spectacle, and even some acoustic bits. Nergal really wanted to make this the new pinnacle of BEHEMOTH’s discography - and it is. His vocal style feels a lot less rushed or sloppy; at times Nergal almost seems to be conveying immense amounts of pain and torment (perhaps due to all of the hardships he’s suffered in the last few years?) - Even when he does his singing moments (oh yeah, they are here). There will be a little hate for these stylistic additions but I personally feel that they should’ve been there the whole time. In my humble opinion, if you can’t tell, "The Satanist" really is a top-shelf effort from BEHEMOTH and completely triumphs everything else that has ever been done by the band. Seriously, you need to give it a run-through even if you didn’t enjoy their previous albums. BEHEMOTH are back, feels good to say that, and it's been a long time coming, four and a half years in fact since the release of the bands last album. The longest break between albums in the bands career, as any fan knows, there is an unfortunate reason for the break, that being Nergal's battle with cancer. Luckily, that's all behind them, and the band is back with a brand new album. So what can you expect from the Polish legends tenth studio album? A hell of a lot, and they deliver. As evident by opening track and first single (and an awesome video) "Blow Your Trumpets Gabriel" the band haven't lost a single beat, they are as brutal and uncompromising as ever, creating a masterpiece of an album. "Furor Divinus" just hammers the point home, this is heavy, this is fast, this is brutal, and this is not for the weak of heart. I'm not going to go track by track on this, why would I? This album doesn't need it. "The Satanist" exceeded any expectation I had, especially for a band that hadn't released any new material in close to 4 and a half years, this album is atmospheric, it's impressive and honestly, from every stand point it is the most complete BEHEMOTH album to date. Just listen to "O Father O Satan O Sun! ", it'll tell you all you need to know. This is an excellent album, and despite this being very early in 2014, I expect "The Satanist" to be prominently featured in many "Top Albums of 2014" lists towards the end of the year, Masterpiece. BEHEMOTH is more than we all can conceive, after years of waiting and yearning a new release, “The Satanist” has come out and have become instantly a masterpiece, not only for the countless talent put in, but for the high amount of energy and specially, It’s like Nergal’s soul has been transmitted to this release, making it something very rare to find in other bands. 9 songs, 4 years, a “terminal” disease, and raw energy and ability, are just the principal components of this album, the band's musicianship has only been getting better over time, and 2014 is the zenith of their power, this release is very tasteful, organized, and coherent, with a mixture of atmospheres, reliving the best moments this band has had, from darkness to fastness, with spectacular riffs, a haunting voice, bass lines consistent and strong, and the drums are just amazing, changing tempos without advertising, and a special effect on the slow parts, that makes you feel you are listening this from the same hell where you want to be taken. This is pure magic, and for sure they have managed along the years to refine their style, their symphony of terror is some of the best I’ve heard in a while, this album is truly recommended to any Metalhead, and this is only because they have done what many bands (if not all) desire to do: a true and straight example of talent, in their own words, in their own style, and in their own terms; when someone doesn’t succumb to a disease, they often become stronger, and “The Satanist” is the legacy and testimony of someone who’s not afraid of Death or Hell, because have understand that the chance to arise is now, then will not be more.